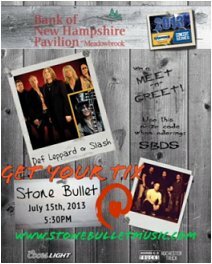 A Vermont band called Stone Bullet will support Def Leppard/Slash in Gilford, NH on 15th July according to their website. The show will take place at an outdoor amphitheatre in Gilford, NH. The first time the band have played in this city. Stone Bullet from Vermont have said they are playing the 'Magic Hat Stage' at 5:30pm before the main show begins. The venue changed its name to Bank of New Hampshire Pavilion at Meadowbrook in April. Ex-Guns N' Roses guitarist Slash is the main support with his solo band featuring Myles Kennedy and The Conspirators. Tickets for this show went on sale on Friday 19th April.